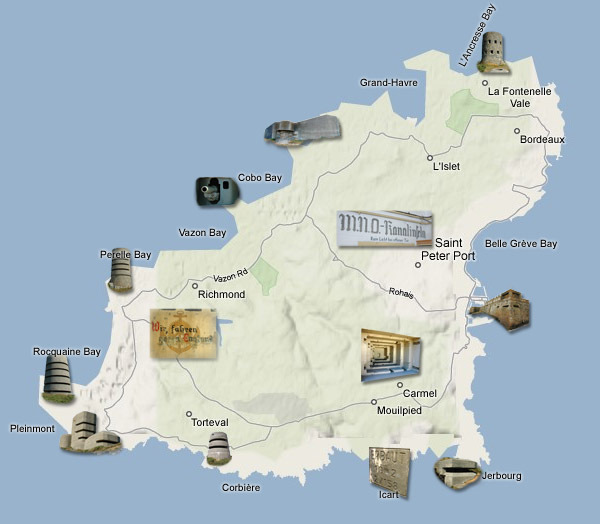 This part of the website covers Guernsey, one of the Channel Islands. Most of the bunkers built on Guernsey are standard designs from a series designed in the early years of the war. They are only built on these Islands and Denmark. In 2008 we have made a new trip to the island. I want to thank Paul Bourgaize for all his help during the two weeks. Without him we would not have seen half of the bunkers on the island. Also Ian Brehaut for showing me the Guernsey Armories HQ at Mirus and other objects and a thanks to the other guys of Festung Guernsey who are doing a great job in preserving the island's bunkers. See their website at: www.festungguernsey.supanet.com. Also a big thanks to Kevin Lajoie for letting us use his beautiful aerial photos. You can see and buy more of his photography at Aeriali.net. Contributions were made by Henk Adriaanse in 2007 and Ad van der Weel in 2014.